Scars are caused by various reasons, and patients want them to be invisible due to aesthetic reason. Scars stand out because they are usually wide open, protruding or depressed, contributing to uneven skin surface, not easily covered by makeup. In the acute stage, scars appear red, darker than normal skin, dehydrated or hypochromatic. Representative surgical procedure for scar is scar revision. By resection and suturing of scar, scar revision is effective for wide or thick scars or those with scar contracture. Scars where scar revision is not applicable can be treated effectively by laser therapy. Laser improves scars by improving what makes scars noticeable, such as unevenness or color changes. Scars cannot be treated by just one laser, and a suitable laser should be selected for each type of scar for optimal therapeutic effect. Scars appear red in the early acute stage due to capillary proliferation and become hard and protruding due to collagen accumulation. In this case, vascular laser therapy can reduce blood circulation in the scar by reducing capillary proliferation and dilatation and suppress the collagen proliferation. For better absorption in the hemoglobin, 570-595nm Nd:YAG (532nm, 1064nm) laser, FLPPD (Flashlamp Pumped Pulse Dye: 585nm) laser, Long Pulse Dye(595nm) laser and IPL (500-12,000nm) are commonly used at 4-6 weeks interval until the redness disappears. Postinflammatory hyperpigmentation (PIH) tends to appear darker than normal skian, and traumatic tattoo caused by forceful penetration of the skin with particles of foreign matter appear black or blue. PIH takes 6 months to longer than 1 year until it returns normal. Whitening cream and peeling cream can improve the appearance, but some cases are left with permanent pigmentation. 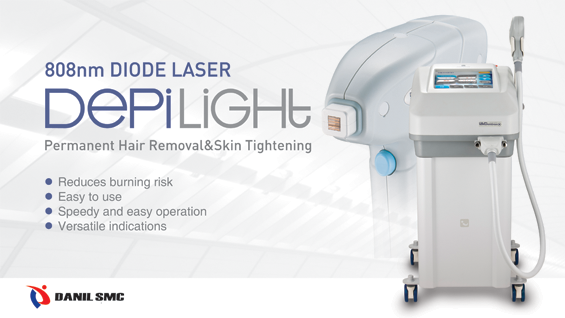 For scar pigmentation or traumatic tattoo, lasers for pigmeneted skin lesions are used, especially Q-switched laser with short irradiation time (nanosecond: 10-9 sec) to prevent damage to the surrounding tissues, and ruby laser (694nm), alexandrite laser (755nm) and Nd:YAG laser (532nm, 1,064nm) for superior absorption in melanin pigments or tattoo particles. Scars with irregular surface can be adequately treated by laser skin resurfacing, which removes the scar from the skin surface and induces skin regeneration. Because the skin is peeled by the burning effect of the laser, laser skin resurfacing can peel off the scar and contract the skin at the same time, contributing to the improved scar. Lasers with high affinity to water at the infrared region, such as CO2 laser (10,600nm) and Er:YAG laser (2,940nm) are commonly used for skin resurfacing. The former provides deep peeling effect, while the latter is advantageous for rapid wound healing and less erythema and pigmentation due to less heat injury. Traumatic scar with irregular surface may not be improved by scar revision and requires laser skin resurfacing for regenerating flat skin surface. Deeply depressed scars, including smallpox scar and acne scar, may not be easily improved but laser skin resurfacing is effective. Acne scars include ice pick scar, crater scar or boxed scar and rolling depressed scar. Various methods are available for acne scars, but the effects are not satisfactory due to the depth of the scar. Scars induced by smallpox or acne are situated deep in the skin and requires deep skin resurfacing. Laser punch out method is often useful because it provides different depth of peeling, rather than uniform depth, relative to the depressed area. Smallpox- or acne-induced scars may not return to the normal skin after laser skin resurfacing, but approximately 50-70% of the depressed depth can be improved by single laser therapy. If the patient wants additional procedure, it is safe to wait for several months until the redness disappears before starting another laser skin resurfacing. In cases where the depressed scars would not be elevated again, the skin site can be pushed with a 3 to 4mm-sized punch to cut the area from the surrounding tissues to facilitate the elevation. If the depressed scar is adhered to the subcutaneous fat layer, 18G needle can be inserted under the dermis to detach the depressed area by subcision and raise the volume by fat injection, if necessary, to elevate the depressed area, flatten the scar, and prevent recurrent depression. Burn scar is induced by wound healing after the skin and the appendages are necrotized. Skin regeneration by laser skin resurfacing is not effective and may even cause side effects, such as hypertrophic scar and depigmentation. Burn scar accompanying scar contracture may require scar revision or skin transplantation, but burn scars only with some smudges and slightly irregular skin surface may be improved by partial skin resurfacing, such as fractional laser. Unlike hypertrophic scar, keloid does not have normal wound healing mechanism, and therapeutic effect cannot be expected from laser therapy. Prevention of hypertrophic scar and treatment of keloid can be expected once low level laser therapy (LLLT), which acts on the wound healing mechanism, is developed. Melanocytes can be damaged by trauma or burn, precluding the production of melanin pigments and causing depigmentation or hypopigmentation, which are difficult to treat and hardly improves. In case of partial hypopigmentation, light therapy or low concentration exfoliant can be used to stimulate melanocyte migration. For depigmentation of a larger area, the scar can be thinly peeled off and split thickness skin graft (STSG) or epidermal graft can be attempted, although the outcomes are not consistent. Laser skin resurfacing may worsen the scar, and some cases may improve by fractional laser. Striae distensae, scars extending from the epidermis to the dermis, are highly likely to end up with sequelae and less therapeutic effect by laser for skin resurfacing. The latest fractional lasers are safe and provide good therapeutic outcomes. Different types of scars have different characteristics and different treatment timing and methods. Among lasers used for scar treatment, such as lasers for skin resurfacing, vascular lasers, lasers for pigmented lesions, fractional lasers, and low level laser, an appropriate laser should be selected considering the type of scar. Laser alone can be effective when surgery is not available, but superior effect can be expected from combination of laser with surgery or injection therapy. The latest fractional lasers are effective in improving various scars that are difficult to treat with other lasers. More about the fractional lasers will be discussed in the next chapter.